Elevation is played on a 12’x12′ square field. 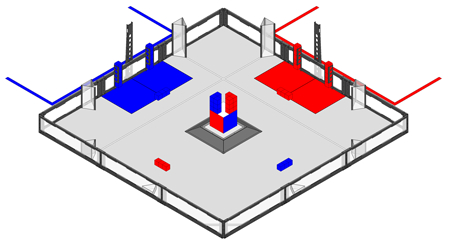 Two alliances – one “red” and one “blue” – composed of two teams each, compete in each match which consists of a twenty-second autonomous period followed by two minutes of driver-controlled play. The object of the game is to attain a higher score than your opponent alliance by placing cubes into goals, and by “owning” goals by having the highest cube in a given goal. Points can also be earned by “parking” on the platform or by “controlling” the bonus cube. There are a total of fifty-eight (58) 3″ cubes available as scoring objects in the game. Thirty (30) of these cubes will be found on the field, twenty (20) in autoloaders located at the edges of the field, while four (4) will be available to each alliance prior to the match. There is one large 10.5″ bonus cube, which starts the match on top of the platform. Each robot (no larger than 18″x18″x18″ to start) begins a match touching one of the colored alliance station tiles for their alliance. There are eight (8) triangular shaped goals ranging in height from 3″ to 21″ off the ground. In addition there is one low goal located in a corner of the field. At the center of the field is a 28″ square platform. It features a 30° ramp, and an 18″ surface. Tournament Champion 44 Green Egg Robotics Green Egg Robotics Club Massachusetts, U.S. Tournament Champion 21B Spur-Flys Champs Charter High School California, U.S. Tournament Champion 404 Elco Red El Camino High School California, U.S.